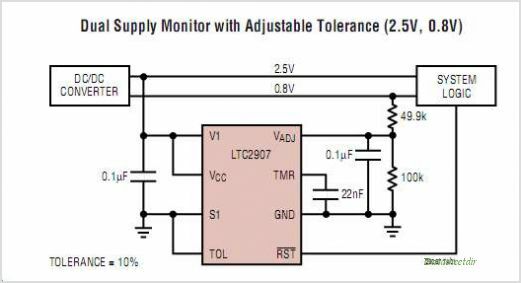 The LTC2906 LTC2907 are dual supply monitors intended for systems with multiple supply voltages. The dual supply monitors have a common reset output with delay (200ms for the LTC2906 and adjustable using an external capacitor for the LTC2907 . These products provide a precise, space-conscious and micropower solution for supply monitoring. The LTC2906 LTC2907 feature a tight 1.5% threshold accuracy over the whole operating temperature range and glitch immunity to ensure reliable reset operation without false triggering. The open drain RST output state is guaranteed to be in the correct state for V1 and/or VCC down to 1V. The LTC2906 LTC2907 also feature one adjustable input with a nominal threshold level at 0.5V, another input with three possible input threshold levels, and three supply tolerances for possible margining. These features provide versatility for any kind of system requiring dual supply monitors. Two three-state input pins program the threshold and tolerance level without requiring any external components. This is one package pinout of LTC2907,If you need more pinouts please download LTC2907's pdf datasheet. This is one application circuit of LTC2907,If you need more circuits,please download LTC2907's pdf datasheet.